We’ve all had that dream of flying (you know the one). That dream, that weightless feeling and lightness of thought can be a reality. Paragliding may not be something you’d consider when embarking on a journey – there are other adventure sports that tend to take front stage, such as sky diving or bungee jumping, but paragliding offers something magical. And to paraglide above some of the most remarkable and beautiful locations in the world truly is a dream come true – here are some of our favourites. 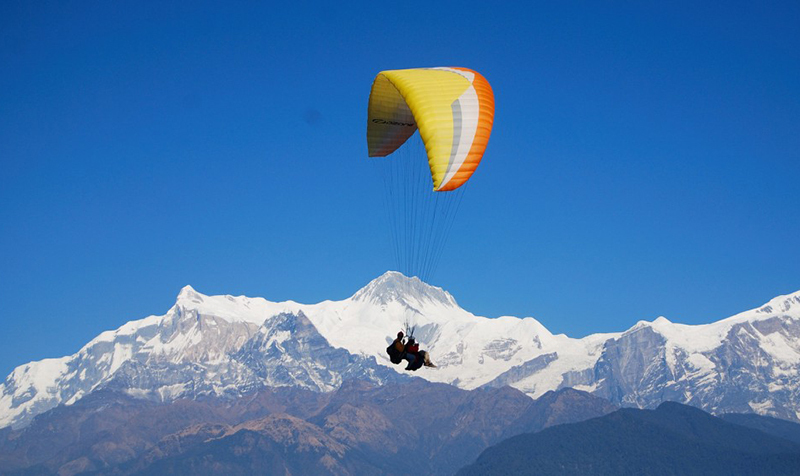 One of the world’s best paragliding locations is the city of Pokhara in Nepal. It’s the perfect spot for everyone, from beginners through to experts, but is certainly not for the faint of heart. Your paraglide begins with a single step… off the side of a mountain, 5,000 feet above sea level. Once you’ve taken that step, you’ll be flying in one of the most beautiful places in Nepal. With views of the Himalayan and Annapurna mountain ranges, this glide is a bucket-list must. A leap from the top of Mount Babadağ is a leap into paradise. As you glide through the air, you’ll experience one of the most photogenic shorelines in the Mediterranean. The striking ocean hues and the soft white sand shores with mountains in the horizon are sure to take your breath away as you float through the skies above. San Gil is for the adrenaline lovers of the world: you can try whitewater rafting, go canyoning, caving, water rappelling and of course, paragliding. Paragliding the Chicamocha Canyon is the definition of “epic”: with the chance to fly up to 1,500 metres above one of the deepest canyons in the world, there is nothing you won’t be able to do after this experience. Possible one of the best places in the world to paraglide are these two northern Indian towns: Bir and Billing. They don’t get enough credit for the incredible beauty they offer – brilliant views of the Himalayan mountains, Tibetan monasteries, and stunning landscapes await. With a run off the side of a mountain (yes, run!) at 2,400 metres, you’ll feel the wind in your hair and feel your breath almost stop short, in awe of the valley views far below. Known not only for its scenery, Valle de Bravo is a paragliding favourite for its consistent weather conditions, and as one of the world’s favourite paragliding locations, it also welcomes numerous competitions including the Monarca Paragliding Open. There are two main flying locations: La Torre and El Peñón, with El Peñón better suited to those with experience. As you fly above, others will ski below: not your usual paragliding experience but one just as remarkable as the rest. This completely unique paragliding experience at Gudauri offers gliders views over the Georgian mountain range, including the ridges of the Stepantsminda and Aragvi valleys. 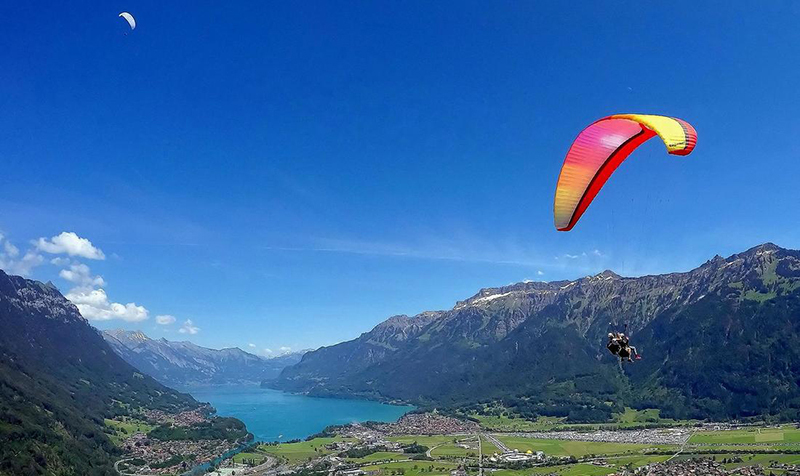 An adventure lovers’ playground, Interlaken has some of the most remarkable views of glacier lakes and snowy mountains, and the views are that much better from the sky. Interlaken is the starting point for trips into Switzerland’s famous Jungfrau region, where you can paraglide over summits of 4,000 metres, in complete awe of the region’s striking beauty. Post-glide, a relaxing pool or spa treatment provides the perfect environment in which to relax and muse over your experience.